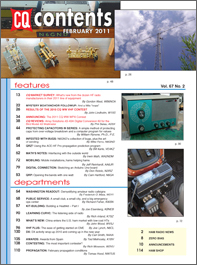 February is our annual CQ Market Survey issue, and this year, Contributing Editor Gordon West, WB6NOA, covers the marketplace of HF transceivers, checking out more than 40 rigs, with prices ranging from $45 to more than $20,000. Next, we have a follow-up on W4DNN's November "Mystery Boatanchor" article, in which we solve part of his mystery (but only part) and clear up a few misidentifications in the original. We've also got the results of the 2010 CQ World Wide VHF Contest, the only truly worldwide VHF contest, marked this year by the addition of meaningful competition in Japan. 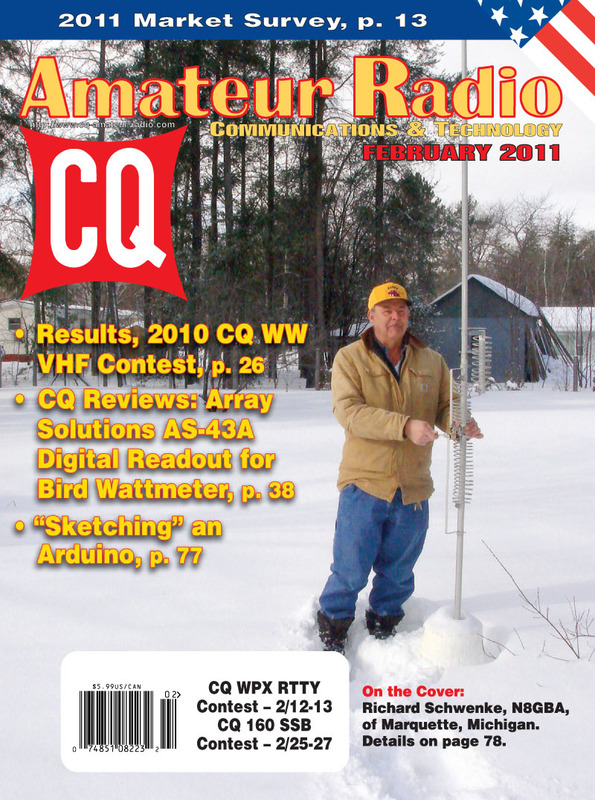 We also have the rules for the 2011 CQ WW WPX Contest, with the SSB weekend coming up on March 26-27, and the CW weekend on May 28-29. You can also link directly to the rules right here. Our February features continue with a CQ Review by Phil Salas, AD5X, of the Array Solutions AS-43A Digital Conversion Kit for the Bird Model 43 Wattmeter. This lets you replace the analog meter on the venerable Bird with a digital readout. Next, William Rynone offers a tutorial on protecting capacitors in series, along with a computer program here on the CQ website to help you calculate the specific values needed for the different circuit options presented. Next, Mike Ferro, N6GND, discusses his collection of CW "bugs" and how he learned to send code with them, in his article, "Infested with Bugs," and Bill Karle, VE4KZ, shows us how to use the popular ACE HF-Pro propagation prediction software in "QRZ? Using a Propagation Prediction Program." Among our columns this month, "Math's Notes" editor Irwin Math, WA2NDM, looks at the different ways in which a circuit might interface with the outside world; "Washington Readout" editor Fred Maia, W5YI, explains some of the mysteries of the FCC's amateur radio callsign system, and Public Service Editor Richard Fisher, KI6SN, on "A Small Club, a Small City, and a Big Emergency Ops Center." Mobiling Editor Jeff Reinhardt, AA6JR, shares reader tips on mobile installations; Digital Editor Don Rotolo, N2IRZ, introduces CQ readers to the Arduino family of kits and development boards, and QRP Editor Cam Hartford, N6GA, talks about the ability to bring life to a dead-sounding band with just one watt of power! K0NEB's Kit-Building column takes us through the early stages of something many of us have done in the past but is increasingly hard to do today: assembling an unbuilt, in-the-box, Heathkit! (He'll finish up in March.) 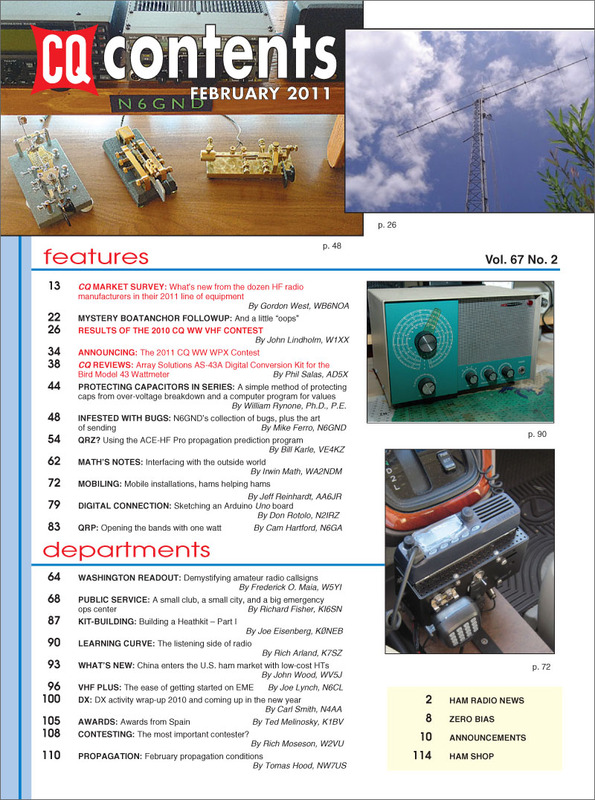 "Learning Curve" editor Rich Arland, K7SZ, takes us to "The Listening Side of Radio," with a quick look at the current state of shortwave listening; and New Products Editor John Wood, WV5J, looks at the new low-cost HTs from China that are entering the US market. "VHF Plus" editor Joe Lynch, N6CL, shows us how easy it can be to work moonbounce (EME) -- no, you can't do it with a handheld, but you don't necessarily need giant antennas and massive power. DX Editor Carl Smith, N4AA, wraps up the last of the 2010 DX news and looks ahead to operations in early 2011; Awards Editor Ted Melinosky, K1BV, introduces us to some awards from Spain for which many of us may already qualify. Contesting Editor John Dorr, K1AR, has stepped down after completing his January column, and CQ Editor Rich Moseson, W2VU, fills in this month with a look at "The Most Important Contester?" Finally, Propagation Editor Tomas Hood, NW7US, looks at expected conditions on the bands in this February of a slowly rising solar cycle. That's a brief look at what's coming up in the February issue of CQ magazine, which should be on newsstands and in subscribers' mailboxes by late January. For information on becoming a CQ subscriber, Click Here. On the Cover: Richard Schwenke, N8GBA, of Marquette, Michigan (Cover photo by Larry Mulvehill, WB2ZPI).